It’s getting near the end of maple syrup season here in Ontario. The sap didn’t run for very long this year, what with the late thaw and the fact that it’s supposed to get up to nearly twenty degrees Celsius by the end of this week. The rising temperatures mean that it’ll be a warm Easter weekend, but it will definitely cut off the sap flow! I hadn’t really taken advantage of the season to make any of the traditional dishes like pouding chômeur, since I’ve been too busy for much baking lately. 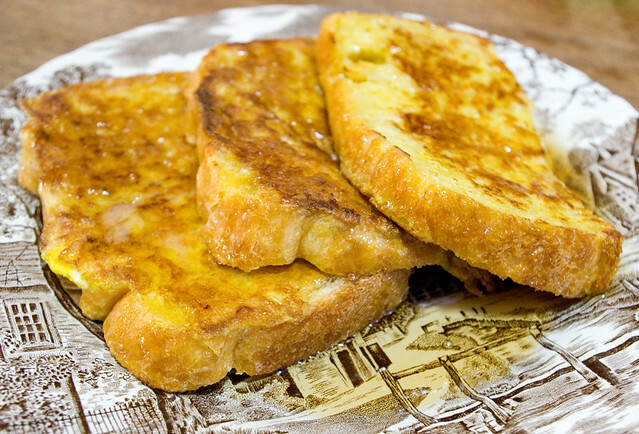 But I wanted to make something seasonal, so I settled on French toast with maple syrup. I whipped up the bread earlier in the day; it’s simply my bread machine fluffy herb bread without the herbs. This creates a light, airy loaf, which is what I prefer for French toast. I added a little bit of vanilla to the whipped eggs, but I didn’t use cinnamon like I normally would so that the syrup was the ingredient that really shone. And it was delicious! 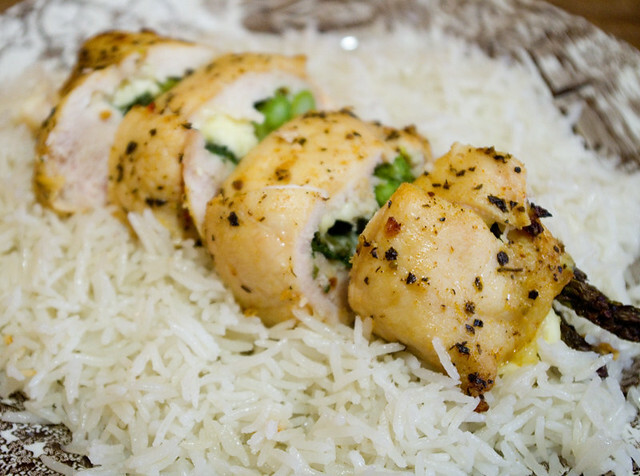 The other day there was a fantastic special at the grocery store on marinated chicken breasts stuffed with feta and asparagus. It was a dish fresh from the butcher section and I thought it would make a lovely treat for the family. As a bonus, although this type of meal has a reasonably long cooking time, it’s not cooking that has to be supervised all that much, so it’s good for busy school nights. I served the chicken on a bed of coconut rice made in the Instant Pot, using the ridiculously easy technique of substituting the water required 1:1 for light coconut milk. This kind of rice is currently the favourite of Thing 1, and it’s a regular request that I find I can easily acquiesce. The whole meal was ready in about 45 minutes, start to finish. I think it’s one that I’d like to make again, even if I do have to take the time to marinade and stuff the chicken breasts myself. I’m thinking that it might be nice to prepare them in bulk and then freeze them for easy meal prep on busier days. I don’t know if the texture of the veggies would suffer, though, so I think I’d have to give it a test run first. I went to the grocery store yesterday to pick up eggs and milk (the two perishable foods we go through the fastest in our household), I popped over to the meat and seafood counters to see if anything tempted me for dinner. As it turned out, they actually had rock lobster tails on for a reasonable price — or at least what I’d consider to be reasonable compared to the ridiculous price that beef has gone up to lately. Lobster in my budget is extremely rare, so I had to pick up enough for dinner. I followed the instructions from Maine Lobster Now and I was impressed with how quick and easy it was. (Most of the lobster I get these days is the much cheaper frozen claws from T&T to make Carribbean lobster bisque.) The girls were a little intimidated by the shell — they’ve had lobster as often as I could afford to serve it, but I don’t think they’d ever had to deal with cracking their own before. I don’t blame them, since even to me the tail looks a heck of a lot like a giant wood louse! Luckily I’ve been to a fair number of lobster boils in my day and, as per the instructions, the meat actually was very easy to remove once it was cooked. 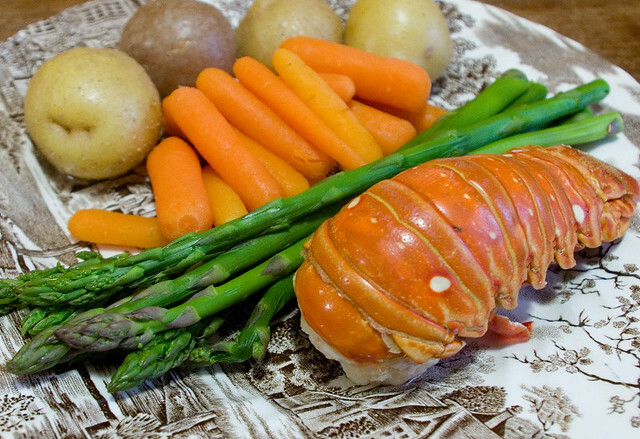 I served the lobster with steamed asparagus, baby-cut carrots, and baby potatoes, all cooked very easily in the microwave. All in all this meal took me about 25 minutes to make, which is good because I was (as usual) running late. One thing I missed out on was garlic butter to drizzle on the lobster, which I do regret, but it was pretty darned good anyway. It seems like I still haven’t caught whatever the kids had last week, which I am very thankful for, but I have succumbed to one heck of a sinus cold. Between the sinus headache and the sore throat, I’ve been pretty miserable. So it’s been all about the canned chicken noodle soup for me, since I don’t even have any homemade stuff left in the freezer. 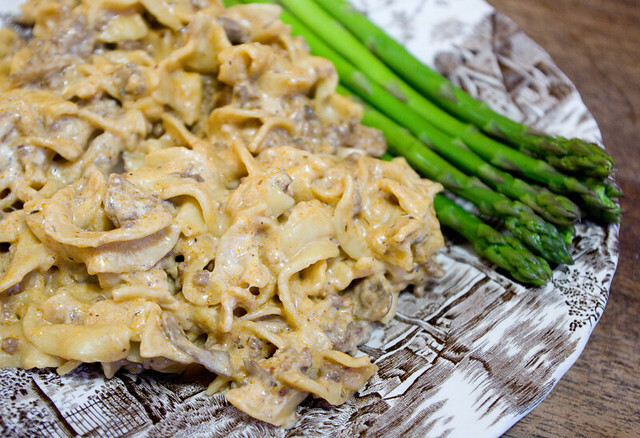 So today I’m going to write instead about another dish I made last week: Ground Beef Stroganoff from The Ultimate Instant Pot Cookbook (Coco Morante, 2018). This dish has made a regular appearance on our table since I made it the first time because it’s quick, easy, cheap, and for some reason I always have half a container of lactose-free sour cream in the fridge that I need to use up. As a bonus, it goes down easily (the cold in our house seems to rotate from person to person, so it seems like someone always has a sore throat), and it’s nice one a cold, wet day, which we’ve had in abundance lately. 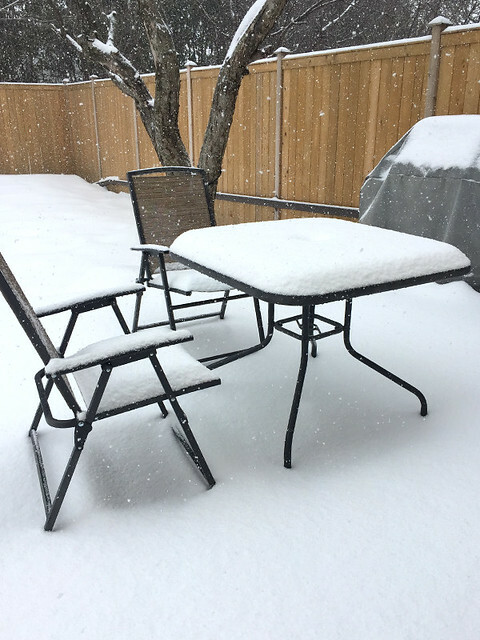 But that, at least, should change soon — it’s been consistently warm enough that I can actually see lawn in my back yard now. Finally! And hey look, I even remembered a vegetable this time. Bonus! The other day my kids had what I thought was a gastro bug, but in retrospect may have been a mild case of food poisoning, mostly because I haven’t caught anything. Generally, if the kids catch something, so do I, since I’m the one who will have to nurse them back to health. If it was food poisoning, it can’t be because of anything I had cooked, because I ate all of the same foods as them that day and was perfectly fine. However, we did grab some cheap takeout that night for dinner, and I had a different dish than the one they shared. That was probably the culprit. So food was a low priority for a couple of days. Instead of writing about that experience in any kind of detail (because nobody really wants that), I’ll tell you about a meal that I made a few days previous. I went through my fridge and realized that I still had a half a jar of Pataks Tandoori Curry Paste, so I just had to make up some tandoori chicken. 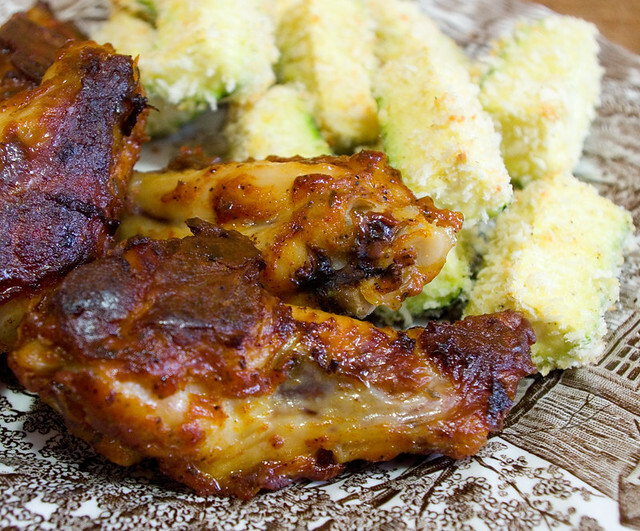 It’s one of my husband’s favourite dishes; in fact, he’s the one who introduced me to it. Apparently Pataks brand is very popular in the Netherlands, where he did a work placement for half a year during university. He was very happy to discover that a few places here in Ottawa carried it when he returned, although a dozen years on it’s become much more common. 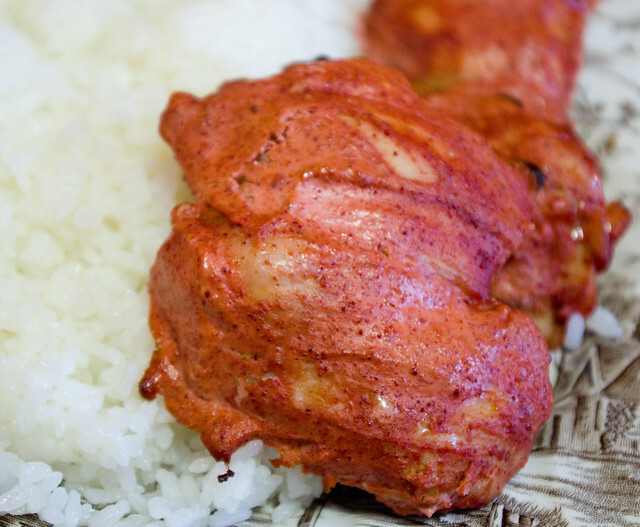 This particular recipe calls for marinating in a sauce of yoghurt mixed with the tandoori paste. I’ve really appreciated that a number of brands of yoghurt have started to make a lactose-free variety so that I can enjoy dishes like this! Other than the chicken, which was simply baked in the oven after being marinaded overnight, I just had to cook up some rice and dinner was done. I probably should have included a veggie or two, but somehow I forgot until right as dinner was to be served. Ah, well. So long as we’re all getting enough fruits and vegetables overall, it doesn’t matter too much that we’ve missed it at one meal. I picked up a PC World of Flavours Greek Seasoned Pork Loin Roast on spec for half price at the grocery store a while back, and I chucked it in the freezer until such time as I could use it. This week I was searching for something different to try for dinner, and it kind of popped out at me. The rest of the family hadn’t been too keen when I brought it home, but I figured it was at least worth a try! I thawed it out and then cooked it in the Instant Pot instead of the more traditional oven, just to see how it would turn out. First I preheated the pot on Sauté with a bit of olive oil, then browned the sides of the roast to add a little flavour. Then I added a half a cup of beef broth and, using this chart as a reference for cooking time, pressure-cooked it on normal for 35 minutes. This means that it took about the same amount of time as cooking it in the oven. I have to say that the final product was much more moist than any pork loin I’ve ever cooked in the oven, but I’m not entirely sure how much of that was due to the marinade and how much was due to the cooking method. The flavour was really nice, though. 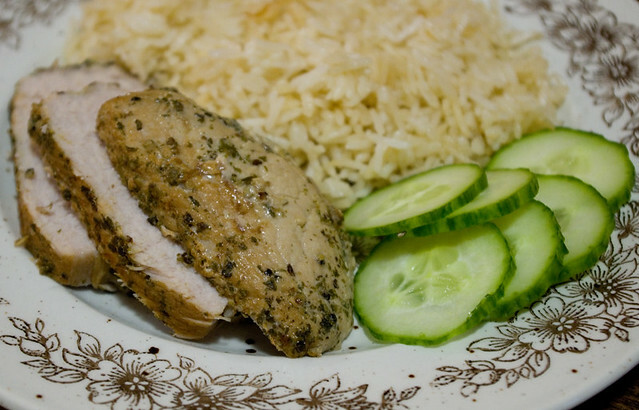 I served the roast with sliced cucumbers and leftover rice reheated on the stove with a bit of chicken broth and salt. I find that this is a great way to use up refrigerated rice because it re-hydrates the grains and gives them a nice flavour. It’s also a great way to cover up that I’ve often got a bunch of different kinds of rice I’m mixing together (the tail-ends of a few meals). I really hate wasting food and I find that rice is one of the most common leftovers in our house. I also often make leftover stir-fry, which helps use up other bits and bobs in the fridge as well.